Visitors at the recently opened Kyushu Geibunkan museum in Japan will be thrilled to discover the museum’s flexible wooden annex. Designed as a space for pottery and art, the wood pavilion provides great views into the modern art hub next door. It’s made from local cedar wood and recycled chip wood, and it is assembled without the use of screws or glue. Kuma’s unique pavilion is an ideal space for art and creativity that provides a relaxed atmosphere for locals to connect. During the summer it benefits from cross ventilation and its close relationship with the surrounding environment. The roof’s modular triangles can be turned upwards to form a light, cloud-like environment that is open to the elements. 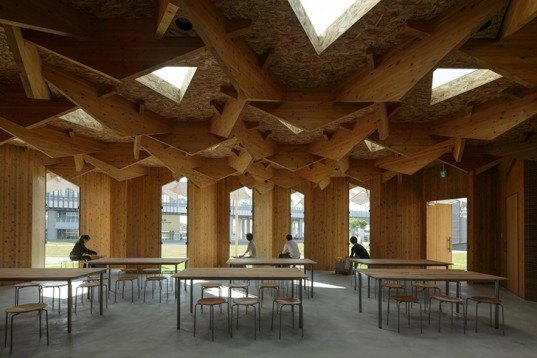 Visitors at the recently opened Kyushu Geibunkan museum in Japan will be thrilled to discover the museum's flexible wooden annex. Designed as a space for pottery and art, the wood pavilion provides great views into the modern art hub next door. It's made from local cedar wood and recycled chip wood, and it is assembled without the use of screws or glue. 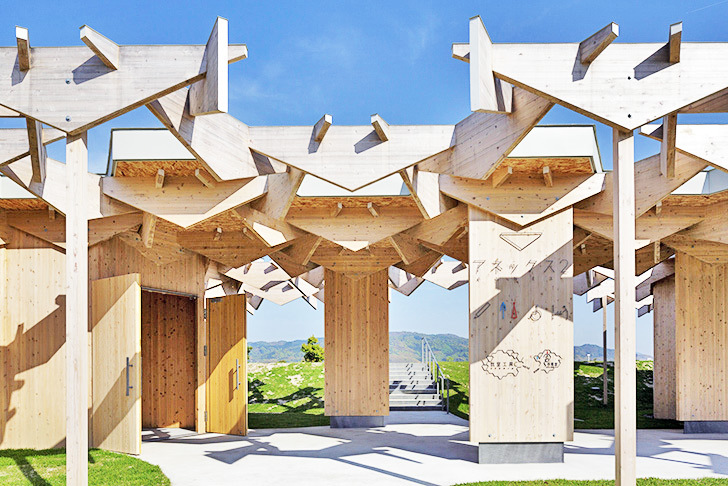 Kuma's unique pavilion is an ideal space for art and creativity that provides a relaxed atmosphere for visitors. During the summer it benefits from cross ventilation and its close relationship with the surrounding environment. The roof's modular triangles can be turned upwards to form a light, cloud-like environment that is open to the elements.